Definition - What does Rooster Pose mean? Rooster pose is a very challenging arm balance that combines the full hip opening of lotus pose with the abdominal and core strength of crow pose. 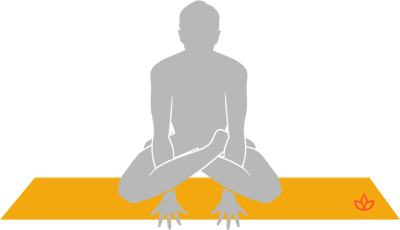 From sitting down on the mat with legs extended in front of the body, the right knee is bent and the foot is placed on the left thigh. Then the left foot goes on top of the right thigh. Arms are brought through the space between thighs and calves, placing the hands firmly on the floor with fingers spread wide. Using the core, hands press down into the ground, lifting the body up. Rooster pose may also be referred to by its Sanskrit name, kukkutasana. This pose improves balance, digestion and strength in the arms, shoulders, elbows and wrists. It is part of the Ashtanga primary series. Rooster pose offers a true sense of general power, with just a taste of the lightness of being that awakens the Source of that power. Before attempting this posture, it is recommended to practice lotus pose. Only after finding comfort and ease in lotus pose should one start practicing rooster pose. To help enter rooster pose easier, though, the practitioner may spray water on the arms and legs to help the arms glide through the legs.